Significantly, the resolution does not purport to authorize the bombing of Syria that began early Tuesday morning. The United States and other imperialist powers, together with their allies among the Gulf monarchies, have launched the new war—directed ultimately at the government of Syrian President Bashar al-Assad—without even seeking UN sanction. On Wednesday morning, President Barack Obama defended these actions in a bellicose speech before the United Nations General Assembly, pledging not only an intensified military campaign in the Middle East, but also issuing fresh threats against Russia. The resolution was adopted under Chapter 7 of the UN Charter, making it legally binding on all member countries. 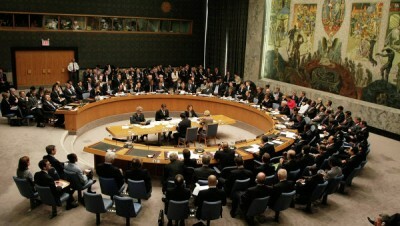 Chapter 7 governs the Security Council’s response to any “breach of the peace or act of aggression,” including authorizing military or nonmilitary action. While the resolution does not explicitly mention military action, it will no doubt be cited in the future for this purpose. To this end, the definition of “terrorism” is left for individual countries to determine. In her own comments before the Security Council, Lithuanian President Dalia Grybauskaite, citing unrest in Europe, insisted that ISIS was not the only target. This was a clear reference to Ukraine, where the right-wing government installed by the US and Germany earlier this year has called pro-Russian separatists in the east “terrorists.” In August, Grybauskaite declared that Russia was in a “state of war against Europe” over the conflict in Ukraine. The passage of the resolution comes as the media in the US, Europe and Australia is engaged in a nonstop propaganda campaign over supposed terrorist threats against the “homeland.” In the United States, news programs have been filled with scare-mongering over Khorasan, a group that US military officials claim is in the “advanced stages” of planning a terrorist attack in the US or Europe. The police presence in New York and other major cities was beefed up on Wednesday in response to these unsubstantiated threats. Already, a number of countries, including France, Australia, Canada and Britain, have proposed or begun implementing measures to strip individuals of citizenship and take away their passports on the basis of allegations of participating in terrorist or “extremist” organizations. There are ongoing discussions within the United States over similar proposals. Last month, following the beheading of US journalist James Foley by ISIS, British Prime Minister David Cameron laid out a series of proposals, including the seizure of passports and the removal of citizenship. Government actions, he said, would target “all types of extremism,” which a British government agency has defined as “vocal or active opposition to fundamental British values, including democracy, the rule of law, individual liberty and mutual respect and tolerance of different faiths and beliefs”—a definition that could be used to cover almost any opposition group. As in the “war on terror” launched after the September 11, 2001 attacks, the real targets of all of these measures are not Islamic fundamentalist groups (in this case ISIS, which is a direct product of the civil war incited by the CIA in Syria), but any opposition to the foreign and domestic policies of the imperialist ruling classes. In other developments Wednesday, British Prime Minister David Cameron announced that he was recalling parliament for a special session to vote Friday on UK involvement in the US-led bombing campaign in Iraq. The move came after Labour Party Leader Ed Miliband gave his assurances that his party would support the Conservative-Liberal Democrat government.